This is my third book in the Color Your Own series by Marvel. In addition to Star Wars, I also have the Civil War and the Young Marvel books. I have really been impressed with the quality of the artwork and the publishing in all of these books. I enjoy Star Wars perhaps best of all three based on my lifelong enjoyment of the films. The book has many of the characters in a wide variety of scenes. Most of the designs resemble the characters quite well. There are a couple that could have been improved but those are in the minority. The designs are detailed and, in many cases, have intricate and very small areas to color. There is a heavy use of shading and of black as part of the designs. That has been true of the prior books as well, so it was not a surprise for me here. I’ve learned to embrace the black as part of my overall design and that has worked well. When there is so much black on the page, I’ve also learned to be really careful if I am using colored pencils. Lighter colors over the black show up. If I use markers, that problem doesn’t happen as the color seeps through instead of sitting on the surface. I use both but am extra careful with I am using lighter colored pencils. Designs cross over the perforation by a very small amount. If you remove pages from the book, you will not lose essential elements. Water-based markers, India ink pens, and gel pens all leave colorful shadows on the back of the page. Colored pencils work well with this paper. I was able to get good color, blend, and layer well with both wax and oil based pencils. Hard lead pencils can dent through the page. I will either remove the page from the book to color or put a safety blotter page under my working page. That will keep the pages below safe from seeping ink or dents. I like to use card stock or a couple of sheets of heavier weight paper. I own a number of coloring books by Marty Noble. Most of those are either fashions, mandalas, or storybook style designs. I was very curious to see how she would create designs that dealt with a farmers market. I grow vegetables and fruits and shop at our local farmers market, so it was important for me that the book got it right. It is beautifully done. There are fruits, vegetables, seed packets, jarred/canned goods, herbs, flowers and more (even chickens). The items are portrayed realistically but are elevated by way of Ms. Nobles wonderful style. It is a beautiful book to color in and it takes me to a visit to a farmers market something that I will appreciate more and more as the winter days start closing in. The designs are detailed and a few contain some intricate and small areas to color. For the most part, they are fairly open and will be easy to color without resorting to tiny nib pens or markers or sharp pointed pencils. As usual, Ms. Noble has provided lots of space for shading and accenting in the designs. I appreciate that as it allows me to either color it as-is or add my own touches to make it unique. This is what I experienced while coloring in this book and testing my coloring medium on the paper. Paper is white, medium weight, slightly smooth and has perforated pages. Glue Binding with perforations so you can remove them one at a time. Gel pens and India ink pens leave shadows of color on the back of the page. India ink pens can bleed through when I use more than one layer of color. Coloring pencils work well with this paper. I was able to use both wax and oil based pencils equally well. I was able to get good color and to get deeper pigment by layering the same color. I found that I could layer multiple colors and blend easily using a pencil style blending stick. Hard lead pencils leave dents on the back of the page. I generally prefer to use a blotter page under my working page to keep ink from seeping through but you can also remove pages from the book to color. I like card stock for my blotter page but a couple of sheets of heavyweight paper works as well. I have bought the Southern Living Christmas holiday guides for years. I always love to look at the beautiful decorations and get inspired for new looks at my home and with my trees (inside and outside.) When I saw that Southern Living had a Christmas coloring book, I was hoping that it would be similar to the guides. Great news is that it is. In fact, on the inside of the front and back cover, there are some photos of the real decorated rooms which inspired some of the designs in the book. The designs range from fun to elegant and cover a wide variety of design concepts. There are 62 designs in the book and they portray everything from Christmas trees to fireplaces to table settings to wreathes. I especially like designs which are food related as those have recipes on the back of the page. I like that as the pages are perforated and if you remove pages, the recipe will stay with the design. The only slight drawback about the book is the thin paper. It is thin enough that it shows through shadows of the designs on the next page. If I could do so, I would drop my rating to 4.5 for this issue but instead, I rounded up (as I always do) to a 5 star rating. Otherwise, the book has exceeded my expectations and I am very happy with it. Paper is very thin, white, somewhat smooth and perforated. Some designs slightly cross over the perforations but nothing essential to the design would be lost if you remove a page from the book. Alcohol-based markers bleed through this paper rapidly. Water-based markers bleed through in spots except for the brush end of Tombow dual end markers. Those leave shadows on the back of the page. India ink pens leave shadows on the back of the page and can bleed through in spots if you apply the ink heavily or in multiple layers. Gel pens leave colorful shadows on the back of the page. They do not require additional drying time over what is normal for gel pens. Colored pencils work well as though the paper is somewhat smooth, it still has enough tooth to grab pigment. I tested both oil and wax-based and had good results with both. I was able to lay down good color, layer the same and multiple colors, and blend easily using a pencil style blender. Hard lead pencils can leave dents through the paper. I either remove pages from the book or use a blotter page of card stock to keep seeping ink and dents from damaging the pages below my working page. A couple of pages of heavyweight paper works well, too. This is a cute coloring book for any fan of Pusheen. The adorable kitty is up to all sorts of fun activities in this book. There are designs which are easy to color (especially good for children or anyone with vision or fine motor issues) as well as more detailed designs. There is nothing too intricate and you won’t need specialty tip pencils or pens to work with this book. I like many of the designs in the book. There are lots of mandalas and themed pages. My favorites are the seasonal mandalas extremely cute! The book is printed on both sides of white medium weight, slightly rough paper, non-perforated paper. The designs do not spread across two pages but the design elements do merge into the binding on most of them. The binding is glued, so you will have to cut pages out if you want to remove them. I found that alcohol-based markers bled through the page quickly. Water-based markers and India ink pens left slight shadows on the back of the page. Some colors of gel pens also left extremely light, indistinct shadows. What I found that worked best was colored pencils. Both oil and wax-based pencils worked equally well. I was able to layer the same color for deeper pigment, layer multiple colors, and to easily blend using a pencil style blender stick. I purchase quite a few fantasy art coloring books but the ones that top my list both in subject and in quality are those by Jasmine Becket-Griffith. Her gorgeous girls have large eyes are so expressive and they simply call to me. The art is beautiful and the publishing of the book is, once again, outstanding. There are 46 pages of Halloween inspired designs filled with 55 different images. There are 43 full page designs and three pages which include 4 each smaller designs. As with her first book, I find it interesting to get the smaller ones and I appreciate that by doing the publishing this way, I get more to color. In fact, the only problem I have with the book is it is so good, I want more. Hopefully, there will be future coloring books in this fantastic series. The designs are on the right hand side of the book. On the sheet opposite (which is the backside of the previous design), the artist ha provided the name of the artwork and when it was created and for what purpose. She then gives us some background information as to how and why she created the artwork the way that she did. I appreciated this in the first book and am glad to see it once again. This is what I experienced while coloring in this book and testing my coloring medium on the paper. I will list, in the comments section below, the coloring medium I used to test this book and with which I usually color my projects. Water-based markers, India ink pens and gel pens did not bleed through. Gel pens required a bit more drying time. Colored pencils work well with this paper. I was able to get good color and to get deeper pigment by layering the same color. I found that I could layer multiple colors well and easily blend using a pencil style blending stick. This was the case with both oil and wax-based pencils. I am using my alcohol-based markers with pencils for detail work and shading. Because of this, I use a blotter page of card stock under my working page. It keeps ink from seeping through to the page below. This is one of a few of my coloring books which have utilized black paper. It makes it really interesting as the paper is black front and back and the designs are printed in white ink. I also purchased the regular line drawn (black on white paper) of this same book and it is really amazing to see how much different the same design can look depending on the ink and paper used. There are 30 designs in this book. Many of the designs are autumn related and a good number are more specific to Halloween. I like both styles. The designs are graceful and fun to color. With lots of pumpkins, acorns, owls, cats, bats, witches and more, there’s a great choice in designs to color. These are my first books by Ebony Rainn; however, I will certainly be looking for more in the future. This is what I experienced while coloring in this book and testing this innovative paper. Alcohol and water based markers bleed through this paper. You cannot see the bleed through easily but I used a blotter page and it saturated through to the blotter. Gel pens and India ink pens left slightly discernible shadows on the back of the page in the sense that the paper looked darker but was still black. Colored pencils worked well with the paper. I was able to get good color, layer, and blend well with both wax and oil based pencils. You need to be careful not to color outside of the lines as it is very noticeably different look than the color on the white ink image. Hard lead pencils can leave discernible dents on the back of the page. I highly suggest a heavyweight blotter page be used at all times. I use card stock or two sheets of heavyweight paper. You can have ink leak through without noticing or dent through the page and mar the pages below. I purchased this book of designs and also its twin which is printed with white ink on black paper. It’s amazing how different the designs look based on which color of paper it is printed on. It is a fun book of designs that work great both both autumn and Halloween. While the order of designs are slightly different in each version, they both include the same designs overall. There are 30 designs in this book. The designs are graceful and fun to color. With lots of pumpkins, acorns, owls, cats, bats, witches and more, there’s a great choice in designs to color. These are my first books by Ebony Rainn; however, I will certainly be looking for more in the future. Alcohol and water based markers bleed through this paper. Gel pens and India ink pens left shadows on the back of the page. India ink pens can leak through if used heavily or with multiple coats. Colored pencils worked well with the paper. I was able to get good color, layer, and blend well with both wax and oil based pencils. Hard lead pencils can leave discernible dents on the back of the page. I highly suggest a heavyweight blotter page be used at all times. I use card stock or two sheets of heavyweight paper. This will keep ink and marring dents from damaging the pages below. Finally and Hooray! Johanna Basford and her publisher have listened to her fans and printed this beautiful coloring book on one side of the page. Not only that, they have perforated the pages so you can take pages out if you wish to do so. The back of the pages are not neglected either as there is the lightest of gray holiday design patterns. The designs are beautiful and evocative of the holiday season. With everything from Christmas trees to polar bears, ornaments to prancing deer, the designs are instantly recognizable as Ms. Basford’s charming style. There are 37 designs which celebrate the Christmas season. Christmas is my favorite holiday and having such a beautiful book of designs to color will help brighten up any dreary, cold days. Not to mention they will be a wonderful way to sit and relax when the holiday season starts becoming more and more hectic. The designs are open and easy to color. This is something that Ms. Basford began in her most recent book (Magical Jungle) and I’m pleased to see it once again. It makes it so much easier to use all forms of coloring medium and with the printing on one side, this time it really should be a choice of any coloring book medium. While several designs are set up too appear as two page spreads, only one design actually has elements which spread across two pages (a small garland and a baseboard.) Those elements cross the perforations and spread over the binding. Not a problem as it is so small and each of the pages can easily stand along as a single design. A suggestion for future books might be a fold-out page for the design or two of this nature. That would keep the whole design together and make it that much easier to color. The cover of the book has fold-outs front and back with coloring opportunities on it. I’ll be interested to see if the UK version still retains the dust cover as it did with Magical Jungle. The attached cover has black line drawings as well as very pretty red, green, and gold foil accents on the front. The cover can be colored, however, it is much smoother in texture than the paper inside the coloring book. The title and presentation pages can be colored as well. I have ordered the UK version of this coloring book. Once it arrives, I will do a comparison of the US versus UK versions. You can look for the comparison in the comments section below. This book is definitely going on my list of family and friend gifts. I can think of several individuals I would love to give it to along with a small set of markers which we get to use finally with this book. This is what I experienced while coloring in this book and testing the paper with my coloring medium. I will list, in the comments section below, the coloring medium I used to test this book and which I generally use for my coloring. Water-based markers and gel pens leave the slightest of shadows on the back of the page. Gel pens did not bleed through the page but did require a little more drying time. Colored pencils worked well. I tested both oil and wax-based pencils with good results. I was able to layer the same color for deeper pigment, layer multiple colors and to blend easily with a pencil style blending stick. This is the newest entry in Zifflin’s Doodle series of books. I own several of the prior books and always have a ton of fun coloring the wild and intricate designs in these books. This book is by illustrator Rocky Villaruel. I really appreciate that each of the Doodle books is by an individual artist. While the subject matter of the books are similar (wild, quirky little creatures and strange bits of elements forming a larger design), seeing each artist interpretation makes each book unique. There are 50 designs in this book with lots of hours of coloring fun to be had. The designs are extremely detailed and many are quite intricate. I am currently using my sharp colored pencils to get to all the tiny spots to color. This is what I experienced while coloring in this book and testing the paper with my coloring medium. Paper is thin, white, slightly rough, and non-perforated. It is standard for any books published by CreateSpace. Book opens fairly flat for coloring if you break or crease the spine. Alcohol-based markers bleed through the paper rapidly. Water-based markers bleed through in spots. Gel pens and India ink pens leave shadows on the back of the page which show colors easily. India ink pens can seep through in spots if used heavily or in multiple coats. Colored pencils worked nicely with this thin but slightly rough paper. I tested both oil and wax based pencils and got good color with multiple layers of the same color, good results from layers of different colors and nice blending results using a blending stick. Hard lead pencils easily dent through the page and can damage the page below. I suggest using a blotter page of card stock or a couple of sheets of heavier weight paper under your working page. It can keep seeping ink and marring dents from ruining the pages below. This is my third coloring book in Creative Haven’s new Escapes line. Dr. Angela Porter is a designer who is one of my absolute favorites. I always have a lot of fun coloring the beautiful and detailed designs she creates. The designs in this book celebrate flowers and gardens. There are a few other fun elements, such as birds, balloons and even a castle to make coloring all the more fun. I have a number of her books by other publishers and two in the Creative Haven line. 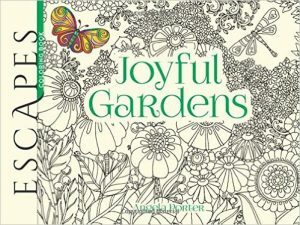 I found that “Joyful Gardens” while detailed, is definitely less so than some of her more recent “Entangled” books. I like the change as I am able to use broader tip medium with some of the designs in this book. The garden designs are still detailed but do not contain as many intricate and tiny elements.